The National Academy of Medicine (NAM) honored three members today at its annual meeting for their outstanding service. The honorees are Elaine L. Larson, senior associate dean of scholarship and research, Anna C. Maxwell Professor of Nursing Research, and professor of epidemiology at Columbia University; Hedvig Hricak, chair of the department of radiology at Memorial Sloan Kettering Cancer Center; and Nicholas Peppas, professor and director of the Institute for Biomaterials, Drug Delivery, and Regenerative Medicine and Cockrell Family Regents Chair in Engineering #6 at the University of Texas at Austin. Larson received the Walsh McDermott Medal, which is awarded to a member for distinguished service to the National Academies of Sciences, Engineering, and Medicine over an extended period. Since her election in 1986, Larson has served on approximately 50 projects, including 17 committees, councils, and boards, such as the NAM Council and its executive committee in the 1990s, and the Board on Health Sciences Policy from 2000-2003. Not only did she serve on the Report Review Committee from 2001-2007 but she also monitored or coordinated a large proportion of the reports that came out of the Academies in that time period, including one on lethal school violence – a topic that is still politically sensitive today. Larson also served as chair or as a member of several consensus study committees covering diverse topics such as environmental health content in nursing practice, school health programs in grades K-12, the Gulf War and veterans’ health, and protective equipment for health care workers to prevent transmission of viral respiratory infections. Larson carefully and methodically helped move reports along from first draft to final product, while striving to be holistic and mindful of the various needs of reports’ readers, such as care providers, scientists, and consumers. To all activities, Larson brought intense dedication to excellence, intellectual rigor, and unwavering commitment to producing unbiased reports to shape national and international policy and practice. 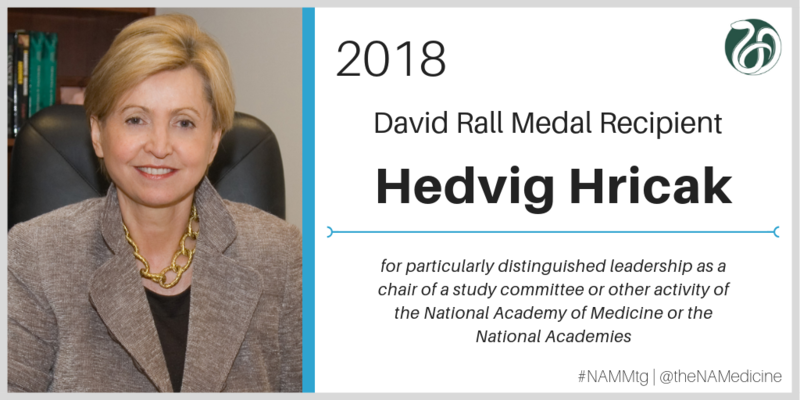 Hricak was awarded the David Rall Medal, which is given to a member who has demonstrated particularly distinguished leadership as chair of a study committee or other National Academies activities, showing commitment above and beyond the usual responsibilities of the position. Since her election in 2002, Hricak has made numerous valuable contributions to the activities and efforts of the NAM and National Academies through her service as chair or member of several committees and symposia, such as the NAM Membership Committee from 2007-2011, the Nuclear and Radiation Studies Board from 2008-2013, and a 2009 symposium focused on radiation exposure from imaging and image-guided interventions. 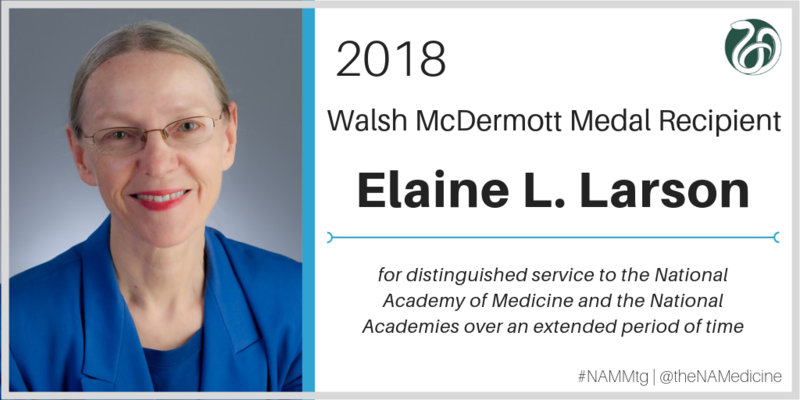 Her contributions to reports of the National Academies, whether on committees or as a reviewer, are numerous and noteworthy and have examined a variety of topics, such as nuclear medicine, cancer clinical trials, radiation from medical diagnostic procedures, and diagnostic error in medicine. Under Hricak’s leadership as chair, the Committee on State of the Science in Nuclear Medicine produced a frequently cited report in 2007, Advancing Nuclear Medicine Through Innovation, which contained five strong recommendations, most of which have since been carried out. Through her exemplary service over about 15 years, Hricak has treasured the NAM as a valuable stimulus for improving science in medicine, the quality of health care, and the state of public health in the U.S. and around the world. 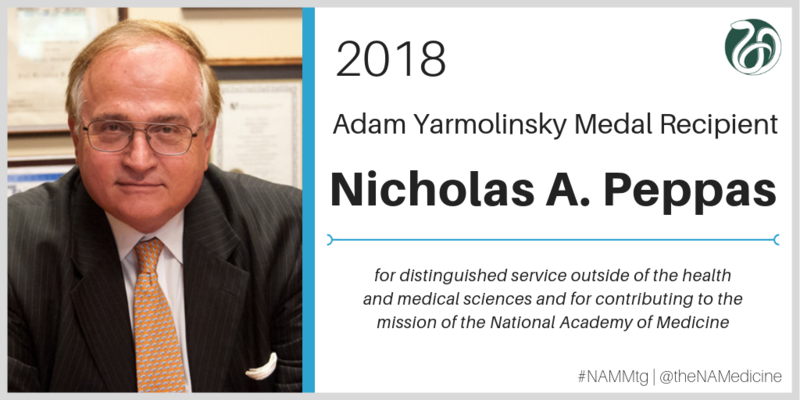 Peppas received the Adam Yarmolinsky Medal, which is awarded to a member from a discipline outside the health and medical sciences who has contributed to the mission of the NAM over a significant period. Peppas is a true pioneer in the development of principles in biomedical and chemical engineering that paved the way for groundbreaking scientific advances with broad ranging applications, such as the delivery of insulin for diabetes treatment, calcitonin for osteoporosis, and interferon alpha and beta for the treatment of cancer and multiple sclerosis, respectively. The tremendous scope and lasting impact of Peppas’ contributions to the literature and to the fields of biomedical and chemical engineering are reflected in over 1,150 publications, which have collectively garnered more than 96,000 citations. His honors include election to several domestic and international societies and receipt of more than 150 awards. Through his service on NAM Membership Committee from 2013-2017 and the Subcommittee on International Members from 2015-2016, Peppas worked tirelessly to recruit and involve members from outside of health and medical sciences, such as chemical engineering and biophysics. He also served on various National Academies committees, such as the Committee on Key Challenge Areas for Convergence and Health, Panel on Benchmarking the Research Competitiveness of the U.S. in Chemical Engineering, and the NSF Graduate Panel on Engineering. In addition to his excellence in research, Peppas is an engaging and effective educator, having mentored more than 230 graduate students and visiting scientists. His unique ability to bring together researchers from disparate fields and his revolutionary research on biomedical and chemical engineering have had a tremendous and lasting impact on the NAM and the nation’s scientific progress.